People learn, all the time and everywhere. Yet it seems we all have our own images and ideas about what learning actually is. More importantly, we all seem to have our favourite approaches to learning, which we call upon whenever a learning situation arises. In our consultancy practice we have noticed people often are not aware of their own implicit images and ideas about learning. We have been witness to some very confusing discussions about how to best approach learning in a particular organisation. In this booklet we attempt to arrive at a common language for talking about learning in organisations. 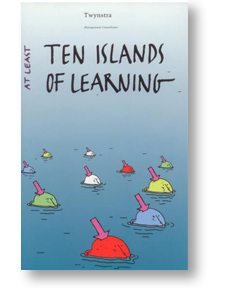 To this end, we introduce the metaphor of mapping the ‘archipelago of learning’. We hope this helps people become aware of their own particular approaches to learning.